Thurburn's page here on the Milby 1960 blog is rather complex because he has sent so much wonderful information and so many interesting photos. I have thoroughly enjoyed communicating with him by e-mail and through the blog. One other thing Thurburn mentioned in his 4-8-10 e-mail: "I am now a member of the American Astronomical Society after receiving the required number of nominations from AAS members." April, 2008 - In our Senior Yearbook the caption under Thurburn's photo indicates he was in the following extra-curricular organizations: JETS pres; Biology Club pres; Science Club pres; Astronomers Club, CSU, Ragnots. That is all somewhat prophetic (and certainly indicative of his interests and leadership abilities from an early age). As I was doing a trackback on someone's google search on 04/12/08, I came upon this internet report of what the now-retired Thurburn is doing with his interests, knowledge and skill. Following the report is an e-mail message and photos that I received from Thurburn when I contacted him to be sure he was indeed OUR Milby 1960 Thurburn Barker. But first, the article from the internet. 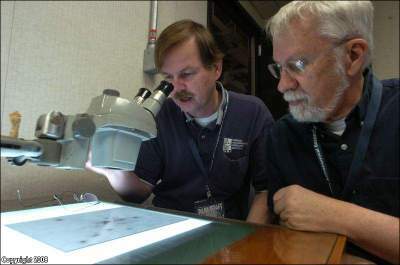 Photo Caption: Thurburn Barker, right, a retired engineer who will handle cataloguing, and Michael Castelaz study a glass negative at the Pisgah Astronomical Research Institute in Rosman on Thursday. ROSMAN — For most of the 20th century, astronomers studying the night sky documented the stars on photographic glass plates. But as technology in the 1990s moved toward digital images saved on computers, these historic images, the life’s work of many retired astronomers, have been boxed up, gathering dust in university closets and even old barns. 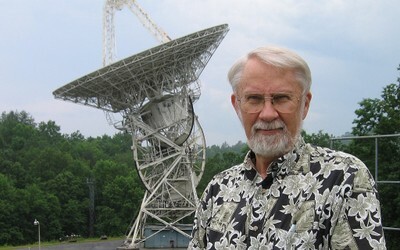 Now Pisgah Astronomical Research Institute plans to save that starry history, setting up the Astronomical Plate Digital Archive at the former NASA tracking station deep in the Pisgah National Forest near Rosman. The workshop, funded by the National Science Foundation last year, brought about 30 astronomers from around the world to PARI to discuss the need to preserve these historical documents. “We got the blessing then to handle this task,” said Dave Clavier, PARI’s vice president of development. These old plates don’t just document the stars, they bear the fingerprints of famed scientists such as Albert Einstein, Edwin Hubble and other leading astronomers and physicists, said Castelaz, PARI’s director of astronomical studies and education. “We call this ‘time domain astronomy,’ ” Castelaz explained. Astronomers can compare past observations captured on the negatives with their current sightings. A Brazilian astronomer recently asked for a particular plate from 1974 that showed the trail of a comet that wasn’t officially discovered until eight months later. PARI hopes to develop a Web site where images could be posted for professional and amateur astronomers worldwide to study and classify these stars for brightness and temperature. Funding could be available from agencies such as the National Archives, Castelaz hopes. “This is a national treasure,” he said. After I read this article, I decided I had better check to be sure this was OUR Milby Class of 1960 Thurburn Barker, although the man in the photo certainly looked like what I would expect him to look like 48 years after I last saw him, the age seemed about right, and the name is an unusual one. I am happy to say that Thurburn replied almost immediately with an affirmation regarding his identity, and much more fascinating information about his work. He also included a couple of photos. Here is that message and those photos. Hi, Karla. Yes. You are correct. Although, I am a volunteer, I've been appointed the Director of the Astronomical Photographic Data Archive (APDA) at Pisgah Astronomical Research Institute (PARI). The work IS fascinating. It has allowed me, in my retirement, to pursue my lifelong interest: astronomy. PARI is very unique. It's a public not-for-profit institute devoted to K-12, undergraduate and graduate education; community outreach; and, research. This is a photo of me in front of one of PARI's two 26-meter (85-foot) radio telescopes. (Double click to enlarge image.) PARI has a tiny full-time staff of 16 people. It's amazing how much they accomplish. The University of North Carolina, Clemson, Virginia Tech, and Furman Universities have experiments and research projects being conducted on the PARI campus. Professors and students from these institutions are on site several days a month and stay for extended periods (PARI has housing on site) during the summer months. 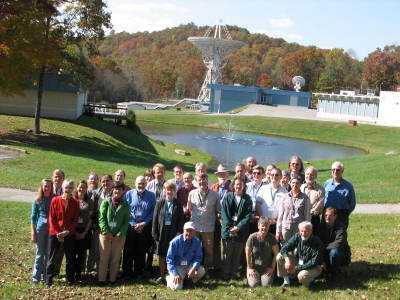 This photo was taken at an APDA Meeting of astronomers from the U.S., Canada, Bulgaria, Italy, Scotland, and Czech Republic. Cathie (my wife) and I are in front kneeling. (Double click to enlarge image.) PARI campus began as a satellite tracking station in 1962. Then, the National Security Agency took over the facility from 1981 until 1995. In 1999, Don Cline (a retired engineer) made a land/facility exchange to create PARI. Don's money along with grants from NASA, NSF, and others and lots of volunteers help PARI to continue to exist. Take a look at PARI's 2007 annual report. (Karla interjects: It is linked from this blog's right sidebar - go to the bottom of right sidebar - the section of links to websites - and click on the link to Thurburn's article in the annual report). Thurburn continues...I'm on the cover. I'm showing three young boys the contents of a photographic plate in PARI's collection from Cerro Tololo InterAmerican Observatory (in Chile) that contains spectra of stars. I really enjoy working with local high school students who come to PARI to work on their senior projects. We'll hold you to that, Thurburn. We'd love to hear more about your life, your family, your work before retirement, other interests - hobbies, travels, etc. In the meantime, classmates, you simply must access the report to which Thurburn refers and determine to read it soon, if not immediately. There are many pictures of the beautiful campus there in North Carolina, and of the fascinating activities that are carried on at that facility. You can double click this URL and go directly to the report, or you can copy and paste it into your browser, or...it is linked from this blog's right sidebar - go to the bottom of right sidebar - the section of links to websites - and click on the reference to Thurburn's article in the PARI annual report). I am in awe of the work Thurburn is doing. April, 2008 - Please take the time now to make a comment in response to the article, the report, and Thurburn's message. You will also enjoy reading the comments that others have left. July, 2008 - But wait, there is more... Thurburn has sent more autobiographical information in several installments over the last few months since this page was started. Read more of his life story, below. According to a hospital “bill” my father sent to me in the 1970’s, I was born at St. Joseph Hospital in Houston on April 8th, 1942. The “bill” amounted to less than $25. I believe the doctor’s services added another $12 to the cost. Health insurance wasn’t as necessary for normal care as it is now. Still, that was about 20% of dad’s monthly salary. My sister, Carole and my parents moved to Asheville, NC, in the spring of 1944. My father, who had been a trolley & bus driver in Houston, received a certification in accountancy via a home study program offered by Texas A&M in 1943. It was the war years, and for some reason, dad had found work in Asheville. We took the train from Houston to Asheville. My earliest memory comes from that train trip. Looking out the window of our coach, when our train was on a siding, I could see people in the other passenger trains as they slowly passed by. What I remember is that the people in the passing trains were all dressed alike … dressed in brown. All those soldiers. All those somber faces. How is it that a small child, who knows nothing about the reality of the world and the fate of those men, can sense apprehension and something fearful in those faces? On my birthday in 1946, we moved to Brevard, NC., a town 25 miles west of Asheville with a population of 2,000, where my dad became the city clerk at $200/month. It was in Brevard where my interest in astronomy began. One evening when I was about 9, my dad pointed to a group of stars that were low on the horizon and said, “That constellation (a new term to me) is the “Little Dipper”. It helped guide me as I drove with my mother and brother from Maine to Houston back in the early 30’s. Road signs are sometimes far apart. Now I had a motivation; a reason to seek out knowledge on my own. I went to Brevard’s library. It was located nearby in a small frame house. I found a book on constellations, Very shortly; I found out that the “Little Dipper” that guided my dad was really a constellation named “Orion”. I had learned two important things. One was that I could do my own research, and the other was that my dad wasn’t always correct. I never found a need to tell dad that his “Little Dipper” was really “Orion”. For him, his constellation got him to Houston no matter the name. Now I had something that served as a central force about which all avenues for my inquiries revolved. In the beginning, my studies in mathematics, physics, and chemistry were done to enhance my understanding of astronomy. Later, even history, music, philosophy and poetry had a linkage to astronomy. In March, 1952, we returned to Houston and very shortly we came to live at 5415 N. Shady Creek Drive in a tiny subdivision known as Meadow Creek Village. Bonner Elementary, Deady Junior High and finally Milby prepared me for my next adventure: work and college - White Sands Missile Range and New Mexico State University. The Southwest desert did something else. It conveyed something mysterious. It was like being in space, so I thought. Road signs are sometimes far apart. This photo was taken in the spring of 1961 on the balcony of my dormitory room (Regents Row) at New Mexico State University (NMSU), University Park, New Mexico. On July 10, 1960, I received a telephone call from White Sands Missile Range (WSMR) offering me a "Co-Op" student position. I had taken the competitive exam for the position at WSMR earlier that year. My original intent was to enroll at Texas A&M, but this opportunity to earn enough money to afford college couldn't be passed up. I worked in optical and radar data-reduction full-time at White Sands Missile Range for six-months from mid-July to mid-January each year. For the next six months, I attended NMSU full-time as a mathematics major. I was able to live on campus all year. My income from WSMR, approximately $2,500 for six-months, was enough to pay for all my expenses for a year. Cathie (Smith), my wife, is also my step-sister. Although she spent 11½ years in the Galena Park School District, she did graduate from Milby in 1963. We have two daughters, Janet (1964) and Heather (1969). After leaving Houston in 1966, we lived in various places, the first two being Colorado and California. In February, 1979, Cathie and I and our two daughters, Janet (then 14) and Heather (then 9) sold our home in Boulder,CO. We bought a sailboat in Sausalito, CA,and spent a year coastal sailing in California. This picture was taken in August, 1979, as we made a passage from Moss Landing to Monterey. We lived aboard our sailboat (a ketch; i.e., a two masted sailing vessel) named Bali Hai from Mar 1979 - Mar 1980. Before we bought Bali Hai, we had given up all our possessions except for books, artwork, and historical documents when we left Boulder, CO. These we put in storage. We bought Bali Hai in Saulsalito, CA. After about a couple of months, we also sold our only vehicle, a 1970 VW Campmobile. We had a live-aboard slip in Pelican Harbor on the north end of Sausalito for four months. During these months, we practiced our sailing skills by sailing in San Francisco Bay. Then we headed south in July, 1979. Over the next few months, we slowly made our way down the coast of California, stopping for extended periods at ports along the way. No set plans. We stopped at Half Moon Bay (3-weeks), Santa Cruz (3-weeks), Moss Landing (1-week) and Monterey (2-weeks) on our way to Morro Bay, where we stayed from late September, 1979, until March, 1980. Whenever we were at anchor or in port, we walked everywhere. We were in good shape. We lived the 'slow' life for a year. Not working and just 'living' on the boat gave us a little different relationship with 'time'. It's hard to explain or for that matter remember how strange our relationship was with 'time'. Time failed to be experienced in a linear or progressive sense. I remember reading 'Shogun' while we were at anchor in Half-Moon Bay. For three weeks Bali Hai was encapsulated in fog. During the day, I read on deck where I was easily transported to the setting where 'Shogun' takes place. The early passages in 'Shogun' involve the pilot of a European ship encountering the fog on the coast of Japan. On Bali Hai, I too could not see any further than the bowsprit of our boat. Thus, I became that pilot. I was in that time. I wondered what reality was hidden in the fog. What a great environment to be in when reading such a novel. When I returned to the working world in March of 1980, it was a culture shock, at least for me. It took a while to get used to the speed at which society moved. Other people's conversations that I would overhear when in malls or restaurants seemed rather shallow or trivial. When we lived aboard Bali Hai, our main contacts were with other full-time sailing families or fisherman or poets and wanderers. There were fewer distractions. Conversations seemed more focused on philosophical issues or maybe on the art of living. After we returned to live on land, it was six months until our two daughters (who now were 11 and 15) re-entered school. By then, they had been out of school for 18 months. They had no problems testing at their grade levels (actually, they both tested at higher levels). But once back in school, it was difficult for them to deal with the "childishness" of their peers. Living aboard and sailing had allowed them to participate directly in our survival and they had grown more independent. It took a long time for them to find more mature and interesting friends. After getting low on funds in 1980, I joined a small ocean engineering firm, Western Instrument Corp. (WIC), in Ventura, California. WIC, at that time, had a staff of six, including a secretary and a bookkeeper. This photo was taken in May, 1981, in Pensacola, FL. WIC was working with Mobil Field Research Lab Dallas on an R&D project to test the efficacy of performing ocean-bottom seismic surveys. The yellow device that's shown in the photo is an EG&G acoustic transponder. Eleven of these transponders were attached to a 3,000 meter sub-sea cable that was placed on the ocean floor. I incorporated shipboard computers, Motorola positioning systems and acoustic recorders into this project. These efforts lead to my being awarded a patent for the acoustic location of bottom-laid cables in 1985. After these ventures, we moved on to Arizona, Colorado again, New Mexico, California again, Arizona again, and finally eastward to North Carolina. Cathie and I have exited (maybe we could call these times a sabbatical) the normal working life a couple of times during our years together before reaching our "final" retirement situation. More on this later. Janet and her family moved from California in 2004 to New Hope, PA. Heather and her husband moved from Glenwood Springs, CO, to Hendersonville, NC, in 1999. While I am enjoying my work at PARI, Cathie is heavily into the Embroidery Guild of America, especially the Hendersonville, NC, chapter. She's been involved with weaving, beading, and the embroidery arts for a long time. From 1969-1979 we lived in Boulder, CO. In Boulder we, at one time, had up three looms. Cathie was president of the Handweavers Guild of Boulder for a while and I did some weaving as well. Timeline of location, employment and miscellaneous info from 1960-Present. 7/1963 - Married Cathleen Jeanette Smith in Galena Park, TX. 3/1966 - 9/1966 Philco Ford Western Division Lab/Manned Spacecraft Center - Mission Control Center (Clear Lake City) - Jr. Engineer - Configuration Mgt. 9/1966 - 2/1979 First Nat'l Bank of Denver/IBM Operating Systems - Senior Systems Programmer. 3/1980 - 1/1991 Western Instrument Corporation, Ventura, CA/Ocean Engineering -Director Computer Systems - R & D projects for oil companies and the Naval Civil Engineering Laboratory. 1/1991 - 4/1994 RV full-timers - Cathie and I worked approx. 6-months/year for Nature and Natural History Associations in National Parks: Grand Canyon (91' and 92'); Rocky Mountain Nat'l Park (93'); and, Death Valley N.M.
1/1994 - 1/1995 National Park Service/ Interpretive Rangers (Cathie and I) - Montezuma Castle National Monument, AZ. April 24,2008 - I will represent PARI at "Space Night" at the Cherokee School District. I will answer questions about PARI and my work as well as provide hands-on remote (i.e., via the internet) operation of one of our radio-telescopes for interested students and parents. This event is in partnership with NASA. Cherokee Middle School is located in Cherokee, NC, at gateway to the Great Smoky Mountain National Park. There are approximately 100 students per grade level. The student body is 98% Native American (Eastern Band of Cherokee). We are a locally run school that follows the NC standard course of study. Our mission as a NASA Explorer School is to provide our students and community with resources and activities to inspire students to continue their education and to excel in math, science, and technology. The partnership with NASA will spark enthusiasm and increase parent and community involvement in their children's education and future careers. July 13, 2008 - I have really engrossed in doing some spectrographic research on two stellar objects: "Eta Carinae" and "Nova Cygni 1920". I finished the "Eta Carinae" study and it was submitted as a poster presentation at the American Astronomical Society (AAS) meeting in St. Louis in early June. The "Nova" study doesn't need to be finished until January, 2009. I should finish it by this fall. Although the research and analysis is mine, other people credited on this presentation are: Dr. Castelaz (my advisor) and Don Cline (the president of Pisgah Astronomical Research Institute). I've also included a couple of smaller photos. One of eta Carinae (eta car.jpg). Eta Carinae is the large bright object in the center. This photo shows the spectrum of eta Carinae. Analysis of this spectrum, and others, is how I determined the chemical elements that are present in the star and it's ejected material. Thurburn writes, "This "1978 Cyrano" photo shows me in Act I of the Nomads Theatre (in Boulder, CO) production of "Cyrano de Bergerac". I'm the one in the lovely brocade outfit (Cathie, my wife, designed and made all the costumes for this production) attempting to duel with Cyrano after taunting him about his nose." Again, Thurburn informs us, "This "1994 NPS Photo" was taken at Montezuma Castle National Monument (50-miles south of Flagstaff, AZ) where Cathie and I lived when we were both National Park Rangers (interpretive)." NOW - Please take the time now to make a comment in response to the article, the report, Thurburn's messages and photos. You will also enjoy reading the comments that others have left. Link does not appear to work. Please send corrected link in e-mail to me. Thanks Thurburn. Keep up the great work and watch out for "black holes" in lifes journey. Oh my gosh! What a phenomenal and inspiring life you've lived and are living. Thurburn, you'll be interested to note that I've sent Karla pictures of our 5th and 6th grade classes and these will appear on our blog soon. I don't spot you in the 5th grade picture, but maybe that's because you were absent (unless the picture was taken before March). In the 6th grade photo I'm standing to your immediate left. I'm interested in astronomy, too, but have forced myself to confine my interest to Nova and other PBS programs. Otherwise I probably would have nudged you out of your illustrious positions. :) :) LOL And you still have a great head of hair! GREAT, GREAT, STORIES...AND TO THINK THAT I PERSONNALLY KNOW YOU. WHAT GREAT CHESS MATCHES WE HAD, AND THE DISCUSSIONS ABOUT LIFE OUT AND BEYOND THE STARS. WE WERE SOME OF THE FEW THAT ATTACKED THE LIBRARY TO CHECK OUT THE NEWEST OF THE SCI-FI BOOKS. FEW KNEW THAT I WORKED IN THE LIBRARY JUST TO OBTAIN THE NEWEST BOOKS BEFORE OTHERS GOT THEIR PEANUT BUTTER AND JELLY HANDS ON THEM. GREAT TO SEE THE ACCOMPLISMENTS THAT YOU HAVE ACHIEVED. HOW ABOUT AN AUTOGRAPHED COPY OF A BOOK OR TWO THAT YOU HAVE PRODUCED, YES, I WILL PAY FOR THEM..LOL WOULD LOVE TO HEAR FROM YOU.